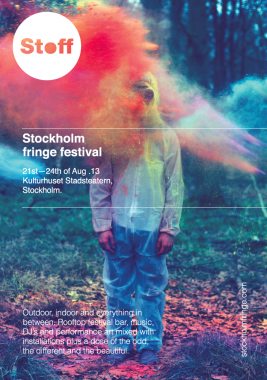 Stockholm has a Fringe Festival too. The 3rd edition of STOFF will take place one more time at Kultuhuset, a giant building dedicated to art right in the center of the city. Since 2011 Stockholm Fringe Fest (Stoff) has been housed in one of Europe’s premier multipurpose arts venues: Kulturhuset Stockholm. In 2012 the neighbouring Stadsteatern joined the Stoff stage family. In the heart of Stockholm just a stone’s throw away from the T-Centralen (Stockholms main tube station) this gigantic palace of culture delivers something for all tastes. Experience the latest in performance art, movies, gallery exhibitions or treat your tastebuds in one of the many restaurants and cafes spread throughout the complex. Outdoor, indoor and everything in between. Rooftop festival bar, Music, DJ’s and performance art mixed with installations plus a dose of the odd, the different and beautiful. Opening Hours: Regarding program and shows. Address: Sergels torg, Kulturhuset. Stockholm.